Next post: I took Alaska Magazine editor Andy Hall to lunch and gave him a year’s notice. He took it well. He made me pay for lunch. I’ve had some great fan mail, like the email a woman wrote to say that Breakup made her blow Sprite out of her nose in an airport lounge. Ms. Stabenow Breakup is one of the best books I have ever read. I have read a couple other Kate Shugak Mysteries like, Blood Will Tell, A Fatal Thaw, Dead in the Water. I enjoyed all of them but Breakup was the best. Keep writing about the Alaskan Bush because I’m sure everybody loves them. Keep up the good work and never give up. By the way I’m doing a book report on Breakup so please write back. It all came to me on my third session of psychotherapy. You see, I couldn’t imagine being in a more miserable state. So I went over the whole sordid affair with my therapist. How I had been seduced by Kate’s intrepidness and heroism, not to mention being a sucker for long, black French braids. But then I had to get into the details of her heroism and…lo and behold…how many times was the REAL hero not Kate, who for all her good qualities is often merely human, but MUTT! I only ask that she get more credit for what she has done…but then, that’s such an infernally human consideration. Mutt’s above all that…one of the reasons I’m so taken by her. Don’t tell me she isn’t real either. I’m coming back as a timber wolf in my next life. And saving money on therapy in this one. I still get mail about Play With Fire, where I dared to tackle organized religion, and may I say, organized religion tackled right back. Letters came in from all over, either praising or damning. I’m told Jerry Prevo, an Anchorage minister who was mentioned in passing in the book, held it up during his televised Sunday sermon and claimed it to be the devil’s work. Lucifer was telling me the other day that he’s never been so flattered. We’re taught never to speak of religion or politics in polite company, but after the Play With Fire letter storm I figured since I was already on my way to hell I might as well go for broke. The Singing of the Dead put Kate in the middle of a political campaign. The readers broke my streak, though, confounding me by loving the book. The only complaint is you can’t figure out Kate’s family tree. That would be something Kate has in common with almost any Alaskan whose family has been here more than one generation. We blame the long winters. About Kate’s family tree, I did finally get one made. 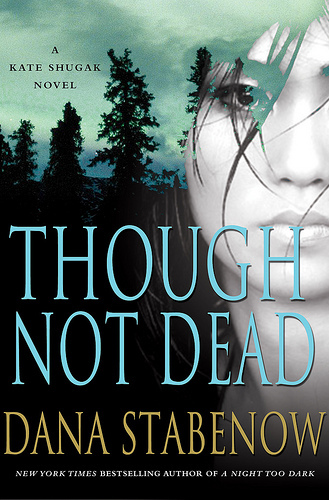 You can see it in the front of Though Not Dead, the most recent Kate Shugak novel.